Japan made it here simply because Senegal let them, they went through on fair play which was down to the number of yellow cards they bagged after head to head and goals difference proved equal; they fought back against Senegal in their second group game to level twice and went on to lose to an already eliminated Poland, the way they closed out the game, passing around like they got nothing to lose when a goal to Senegal or Poland could get them eliminated showed lack of ambition and the champion stuff it takes to play at this level. 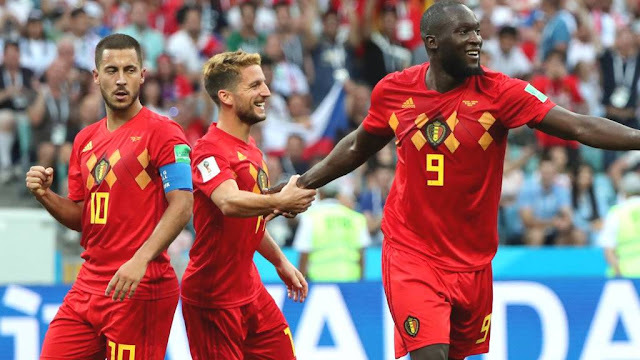 Belgium have been the most impressive team so far at this World Cup, winning all three including the 1:0 triumph over the three lions of England, you can argue they only played Panama and Tunisia, but you must remember those teams didn’t just lie there for the cane, their tactics won the games as they relied on long balls and spatial passes, on paper there is nothing of a miracle to be expected from the Japanese but this is the FIFA World Cup that looked like one for the underdogs. Japan would rely on the quick feet of Takashi Inui, all Belgium need to do is to peg him back with the runs of Thomas Meunier and Carrasco, he turns into a wingback and will not too often think of going forward; in the middle of the pack, it’s very hard for Japan to fashion out anything with the presence of steel like Axel Witsel and Kevin De Bryune, they should be wary of over the top passes and inward runs of Eden Hazard. Romelu Lukaku should be fit enough to step up and deliver again, he has four goals already and he’s not willing to stop scoring, it will take more than luck, discipline and a bad day for the Belgians for Japan to stand a chance; if Belgium underrate Japan, looking ahead to their more difficult quarter-final fixture, Roberto Martinez knows he has to get there before he plans for that, so no chance for Japan.